Police were called to the Starbucks at Astor Place this morning after a suspicious package was discovered there, adding to the tense mood in the wake of the Boston bombings yesterday. The situation was quickly diffused when the customer who had walked away from the worrisome item came back to claim it. The manager on duty declined to comment further, so the nature of the item is uncertain. 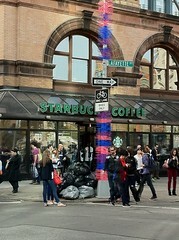 The Astor Place Starbucks was targeted almost exactly a year ago, on April 14, by a group that attempted to smash its windows with steel pipes. At the time, police pinned the mayhem on anarchist protesters. Previous post East Village Cappuchampion Aims For Best in U.S.